W’s brother is getting married this weekend. On Sunday, W and I coordinated our outfits for the rehearsal dinner and wedding, making sure my ties won’t clash with her dresses. It’s so exhausting being a lesbian power couple. Sunday evening, I ended up running out to Kohl’s department store to pick up a few things. I am mostly over the awkwardness that comes from shopping in the men’s department. But on this particular shopping trip, I found myself feeling a bit like a strange mythical being. Kinda sorta like a centaur — one creature from the waist up and another from the waist down. While I was standing in the checkout line, I channeled my inner unicorn and reminded myself that I am a magical, mystical creature. I am a big, bad, beautiful butch. I stood head up, shoulders back. As I daydreamed about rainbows and flying horses, I heard the cashier’s overenthusiastic cry. One Chaps-brand purple plaid necktie. One pair of navy suspenders. Welcome to my world, I thought. Imagine what it’s like to be me. The young woman quickly rang up the items and placed them in a bag and sent me on my way. I hurried home to show W my new wares. For fun, check out this quiz that answers that age-old question: What kind of magical creature are you? What kind of magical creature are you? You can take the quiz here or just respond with the creature you think is most like you. Oh c’mon, it’ll be fun. 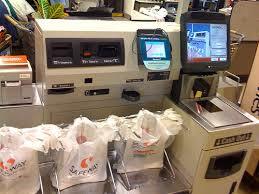 I was standing in the self-checkout line in the grocery store earlier this week. A man who was in line in front of me left his cart to grab something he had forgotten. I could see him motion to the woman behind him to go ahead and take his spot. I didn’t know how long he’d be gone and I was impatient, so I moved ahead one space in front of his unattended cart. He returned in less than a minute carrying a single roll of paper towels. He was smiling and laughing when he said it. The words “good natured” come to mind. I apologized and stepped back into my original spot. “Besides, she’s better looking than you,” he said. In a conventional sense of attractiveness, she was. Soccer mom type. Yoga pants. Decent looking. I scanned my mind for a quick comeback. It all depends on what you’re into, pal. My wife would disagree with you. She’s certainly better looking than you, too. I’m not an on-the-spot kind of person, so I just stood there with a smile on my face. In the end, he clapped me on the shoulder and insisted I take his spot in line. I wasn’t sure if he was being nice or if had had started to feel guilty about what he had said. No hard feelings, y’know? 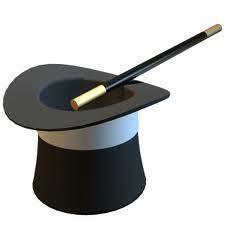 So, this is for all of you quick thinkers out there. What should I have said? Give me your best lesbian comeback for this situation. The ring looked something like this but with a dark blue stone. I stopped by a store this afternoon to pick up something for W. While I was finishing my transaction, a gentleman walked up to the counter and asked to exchange a ring that he had purchased earlier in the day. “My friend says it’s a woman’s ring,” he said. The man looked like he was in his fifties. He was wearing a Philadelphia Eagles cap, a plain navy blue jacket and a Band-Aid in the middle of his chin. He was Asian and spoke slowly and with a heavy accent. “Where are the men’s rings?” he asked. The store manager tried several different ways to explain that the store did not sell men’s rings and women’s rings. “Both men and women shop at this store and buy these rings,” he tried, waving his hand across the display like Vanna White. “Where are the men’s rings?” the man repeated. I wanted to yell out “unisex, he is trying to tell you that the rings are unisex,” but the longer I waited, the word “unisex” started becoming weird and vulgar and dirty as it rattled around in my head. Who likes big rings? This guy. At some point in the discussion about men’s rings and women’s rings, the manager interjected that women really like men who wear jewelry, but that didn’t seem to help either. 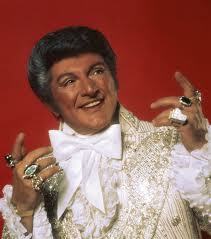 Well, Liberace certainly had his fans, I thought. But then what do I know about guys and girls and jewelry. 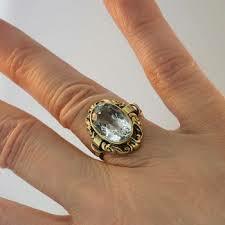 The ring that the man had purchased during his previous visit to the store was very large and ornate with a big round blue stone in the middle. Too girly for me, I thought, because that’s how I am. It looked odd on him — not because it was feminine but because he didn’t look like the kind of man who wore jewelry. Maybe a plain gold wedding band, but that was about it. Is this manly enough for you? As I was leaving the store, the man had agreed to swap the ring that he had purchased for another ring that was similar but had a rectangular stone. I suppose it looked more manly, more like a man’s ring. 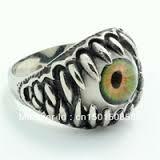 The manager had tried to sell him on a ring with a fake eyeball in the middle. Evidently, nothing says arm curls and Old Spice like an eyeball ring, but the man wasn’t buying it. While I walked to my car, I wondered if the man would have returned to the store if his friend had told him that the ring was ugly or clashed with the color of his eyes. I thought about how we place so much emphasis on what is appropriate for men and what is appropriate for women. In the end, a ring is a ring. Pink is just a color, and so is blue. And if you like it then you should put a ring on it and call it your own. It’s been difficult to find time to keep this blog up to date. I have been dutifully attending my weekly writer’s group and trying to press forward with my memoir one chapter at a time. Between that and the writing that I get paid to do, I haven’t had a whole lot of time for The Flannel Files. It’s funny, because this blog started the whole creative writing thing in motion. Anyway, I thought I would share some writing that I did today in group related to the theme of my work in progress. My memoir has a number of themes, all related in some fashion. When I stop and think about the main theme, “gender” is the one word that comes to mind. It seems to be a clear-cut topic. Boy. Girl. But in my world, it has never been clear-cut, which is why I have a story to tell. The lines have always been fuzzy. Actually, not fuzzy but movable. For much of my life, I have had to put my shoulder down and push with all of my might to move the lines that most seem content to walk within. Gender is such a common identifier: a capital M or F on a driver’s license or a checked box on a birth certificate. There is never any room for in between. Everything is always hard and fast. 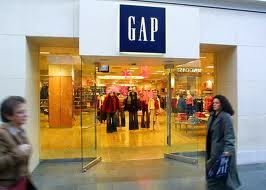 I always think of the gravitational pull that I used to feel when I entered The Gap clothing store at our local mall. The women’s clothes were on the right side of the store. The men’s clothes on the left. I always felt a tug of duty to enter on the right side and pass my eyes over the khakis and the button-down shirts there. Eventually, I would loop around to the left side, which contained more khakis and button-down shirts. In my mind’s eye, these were authentic khakis and button-downs. They always felt more real and practical without the extra stitching or pleats or darts. In a way, my life — my battle with gender — has been a giant loop around a boy/girl clothing store. At first, I sought acceptance but eventually mustered up enough courage to just shop on the left. I had to go to Kohl‘s today and pay my credit card bill. If you’re not familiar with Kohl’s, it’s a department store sort of like J.C. Penney but way better. Because I was already inside the store, I decided to do some shopping. How can this not make you smile? One snowman hand towel for the freshly painted downstairs bathroom. $4.00. Who says lesbians can’t be interior decorators? They had a really cute and fluffy white snowman towel, but we have three teenage boys. You do the math. Note to butch: Don’t forget to buy a lot of really nice white stuff like towels and rugs — but not cocaine — after the kids leave home. You probably won’t need mind-numbing drugs after the kids leave home. It’ll be like one giant Dinah Shore White Party every single day of the week. One pair of Philadelphia Phillies pajama bottoms. $4.20. On clearance. Things I love: the Phillies, pajamas, elastic waistbands, sleep. Win, win, win, win. I will be like Charlie Sheen when I wear these this spring. Winning. Big time. So cute. I love the tiny little silver button on the fly. And they have pockets! Bonus. One funny unicorn T-shirt. $2.40. On clearance. Ok, so Middle Age Butch is not all fluffy and rainbowy and into unicorns and glitter. I mean, I would eat unicorn meat in a heartbeat. Especially barbequed unicorn. Or braised unicorn. Or unicorn parmesan. Wow, my mouth is actually watering now. But this T-shirt caught my eye. I have a thing for T-shirts. Which means that I have way too many and when I open up my closet to grab one to wear, the whole pile teeters and I have to quick close the door before they come crashing down and bury me alive. Although in the realm of all possibilities, being suffocated by my awesome T-shirt collection is not such a bad way to go out. Oh, I like jokey things about therapy, too. If you haven’t noticed. What about you? What’s the coolest thing you’ve purchased in recent weeks?